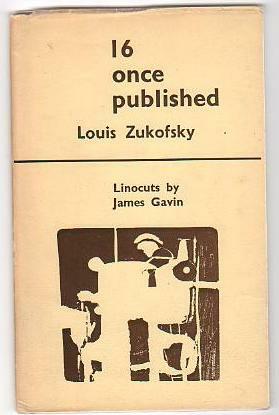 Some of the following information is from Celia Zukofsky’s A Bibliography of Louis Zukofsky (1969). Information not in brackets is as printed in the volumes. [privately printed] [41 pages, 12 x 8 ¾ inches, mimeographed, bound in manila folder] First edition, limited to 55 autographed copies, numbers 1 to 15 for presentation. 30 Willow Street, Brooklyn 2, N.Y. Printed by The Profile Press, New York. Some Time. 1956 Jonathan Williams, Publ. [10 x 6 inches, paper wrappers] 300 copies, Author’s edition [boxed] of 50 by Dr. Cantz’sche Druckerei, Stuttgart, Germany, autumn 1956 designed and published by Jonathan Williams as Jargon 15 [with musical score by CZ on front cover]. [published 25 June while LZ was poet-in-residence at SFC at Robert Duncan’s invitation during the summer 1958]. [Note at back]: Except for the page number, pages 8 through 73 [i.e. the poems] are the handwriting of LZ. All other matter is in my own, since the poet was unaware of this venture. The holocaust [sic] on the cover is part of the original draft of the poem “4 Other Countries.” C.Z. 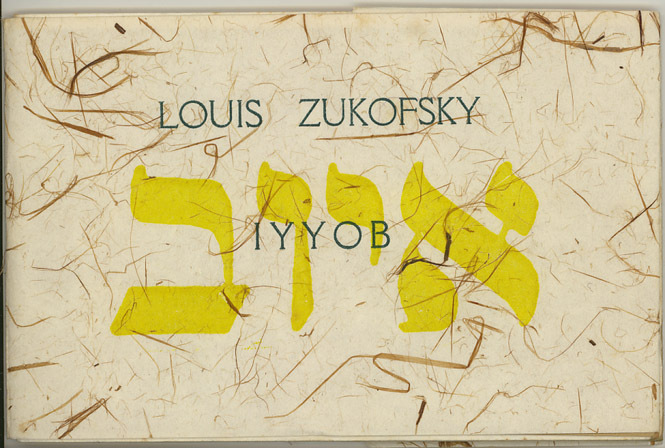 This book is a facsimile of Louis Zukofsky’s handwriting limited to three hundred numbered and signed copies. Offset for Celia Zukofsky, 135 Willow Street, Brooklyn 1, New York. [15 looseleaf cards dedicated to WCW. 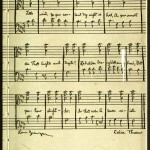 Handwritten poems signed by the poets with drawings by Fielding Dawson. Poets include Allen Ginsberg, Paul Blackburn, Bob Brown, Edward Dahlberg, Max Finstein, Paul Goodman, Denise Levertov, Walter Lowenfels, Edward Marshall, E.A. Navaretta, Joel Oppenheimer, Gilbert Sorrentino and Jonathan Williams]. [296 pages, 7 ¼ x 5 3/8 inches, red cloth] With an essay on poetry by the author and a final note by William Carlos Williams This first edition is limited to 200 copies printed by the Genichido Printing Company in Kyoto, Japan, December 1959. The text has been entirely handset in Garamond 10.5 pt. [132 pages, 7 ¼ x 5 ¼ inches, green cloth] Of this first edition limited to 250 copies handset and printed by the Genichido Press in Kyoto, Japan, October 1961, the author has numbered and autographed fifty. [Contents lists years “written”: “It was” 1941, “A Keystone Comedy” 1941, “Ferdinand” 1940-2, “Thanks to the Dictionary” 1932]. 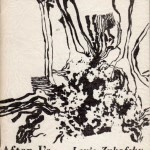 [22 leaves, 8 1/8 x 5 1/8 inches, paper wrappers, stapled] a selection by his wife from 55 Poems, Anew, Some Time, Barely and widely (1925-1958) Linocuts by James Gavin. [limited to 350 copies]. 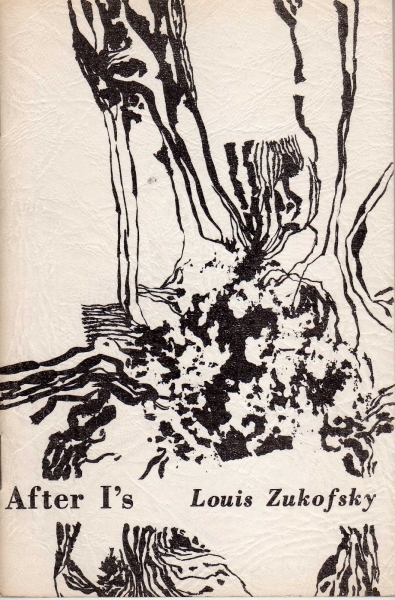 [40 pages, 4 ½ x 6 7/8 inches, paper wrappers, stapled] Drawing of LZ on inside backcover by Sandra Olenik. Cover from a photograph of Ryokan’s Scroll from the collection of Cid Corman. [Ryokan's scroll is printed upsidedown]. [Vol. 2: ] Acknowledgements for previous appearance of Gower Chorus, Act I to Black Mountain Review. 1040 copies of this second volume of Bottom : on Shakespeare have been printed in Baskerville & Bulmer types together with reproductions of the original music by Celia Zukofsky Drawings by Cyril Satorsky Design by Kim Taylor [the drawings in both volumes on the end pages, title pages, etc. are essentially the same exept that the image of sword, crown and book in Vol. 1 is replaced by that of a lute in Vol. 2]. A Test of Poetry. 1964 NY: Jargon/Corinth Books (Jargon 11). $1.75. [Note on cover design by Jonathan Williams:] The design of the cover is a palimpsest giving Zukofsky's sense of the poetic tradition across all time and geography. A strophe of Sappho's Greek has been written by Christopher Middleton; the same fragment of Catullus' translation is blown up from Latin incunabula; the Catullus is seen in the hand of Louis and Celia Zukofsky, who are translating all the Carmina; Sir Phillip Sidney's version is here written by Lou Harrison; and, finally, Sappho's original stanza, Americaned by Dr. William Carlos Williams and set in Lutetia type by the Grabhorn Press. [43 pages, 8 ½ x 5 3/8 inches, paper wrappers, stapled] Cover by Don McIntosh. [26 pages, 6 x 4 inches, paper wrappers, stapled] Cover by Sally Barnes. Inside back cover [abstract drawing of LZ], by Jonathan Williams reproduced from Some Time (Jargon). Finally a valentine — Opening No. 1. Jan 1965. [one sheet folded in on each side to form a card, 9 x 4 ½ inches] Edition of 500. [Gives LZ’s address as] 77 Seventh Avenue New York 10011. Typographer Edward Wright London Artist John Furnival Woodchester, Glos, England Printer Stephen Craig—The Piccolo Press, 48 Lansdown Stroud Glos. England Poem by LZ Oct 23/63 “my last short poem for a long time” this finally a valentine will close or now closes my collected short poems to be called ALL. 77 copies set and printed by hand in Harvard Yard by the Adams House & Lowell House Printers May, 1965 [8 pages (4 pages of text of the first 37 lines of “A”-18), 4 ¾ x 3 ½ inches, paper wrappers]. [numbered and signed]. [4 pages, 2 ½ x 3 inches, paper wrappers] 20 copies printed by LHS [Laurence H. Scott] on an 1816 Washington hand-press in Harvard Yard, June, 1965. [numbered and signed]. IYYOB. 1965 Turret Books / 5 Kensington Church Walk London W.8. [5 unnumbered pages of text of first 45 lines of “A”-15. On cover the title is echoed in Hebrew]. 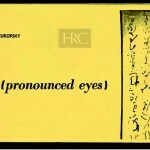 [excerpts from throughout “A” composed to date]. [Contents:] Die form [handwritten note: “mistranslates original LZ”] Chronological note [includes:] “lines 1 to 75 of “a”-9 first appeared in first half of “a”-9 limited to 55 copies not to be reprinted. LZ” Guido Cavalcanti’s “Donna mi priegha” Two halves of “A”-9 [signed and hand-corrected in red ink by LZ]. [61 pages, 7 ½ x 5 inches, blue cloth] Printed by Villiers Publications Ltd, Ingestre Road, London NW5 275 copies of this book have been printed. 250 of these, numbered and signed by the author, are for sale. A further 25, lettered from A to Y, are for the author’s own use. [Text consists of first 8 chapters of the novel. Dated 1950, revised 1967]. from Thanks to the Dictionary. 1968 The Galley Upstairs Press, 3400 Main Street Buffalo New York 14214. Catullus Fragmenta. January 1969. Turret Books (5 Kensington Church Walk London W8). Trans. 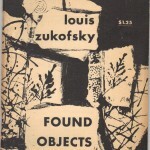 by Celia and Louis Zukofsky. 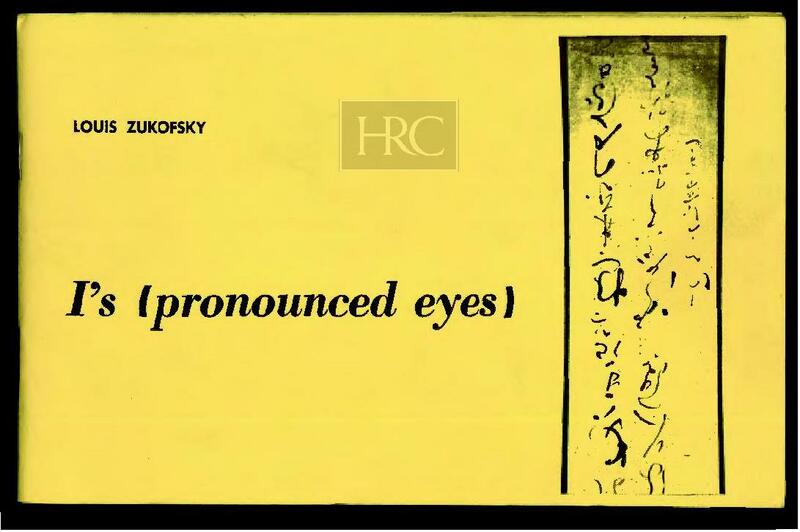 Music by Paul Zukofsky. [10 pages, 12 x 10 inches, paper wrappers] Acknowledgements to Cape Goliard Press. Designed & printed at Trigram Press London WC1 Edition limited to 100 copies numbered and signed by the composer & the translators. 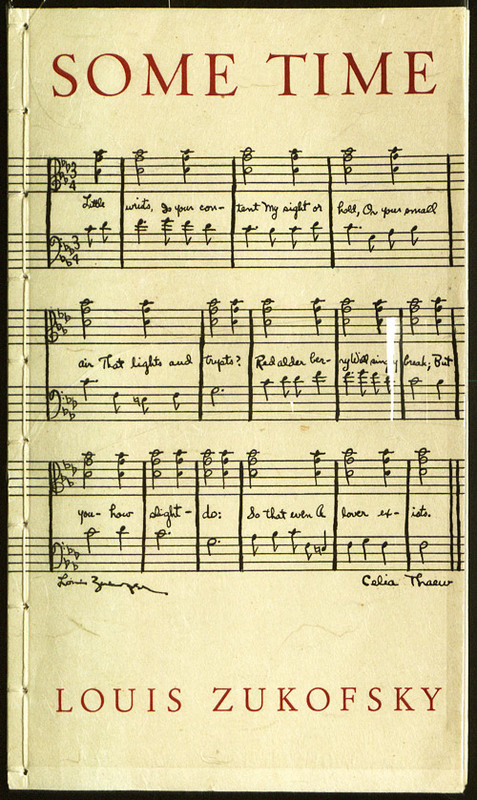 [One page of translations of Fragmenta with original Latin, followed by 5 pages of music with dedication: “for two singers in Syracuse”]. [The opening block of three lines of “A”-22 printed in dark blue letters on a yellow background and signed LZ. One of a series of 8 postcards that also includes: James Tate’s “Jim’s All Night Diner,” Gary Snyder’s “Go Round,” Nhat Hanh & Vo-Dinh’s “Peace,” a Papuan Drawing Post Card, Octavio Paz & Tim Reynolds’ “Scribble,” Anselm Hollo’s “Message.” On the paper binder for the series, LZ’s poem is listed as “Concrete Poem”]. New York Designed and printed at the Ferguson Press, Cambridge, Mass. 26 copies lettered A to Z. 100 copies numbered and signed. [10 unnumbered pages of text of the first 100 lines of “A”-22, excluding the opening block of three lines]. 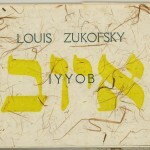 [boxed, off-white cloth] to C signed and dated by Louis Zukofsky is limited to 80 copies printed for him by letterpress in Monotype Bembo at The Stinehour Press Lunenburg, Vermont. [signed] Atque in Perpetuum L.Z. January 23, 1904 – May 12, 1978 C.
[paginated 1-80 plus opening poem: “Heart us invisibly thyme time”]. 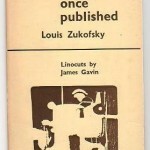 This enlarged reproduction is taken from the original draft of Volume One, Part Three of Louis Zukofsky’s long study Bottom: On Shakespeare, published in September, 1963, in an edition of 1040 copies by the Ark Press at Austin, Texas. The manuscript, torn from a spiral-bound notebook, later destroyed, measures approximately 5 inches by 8, and is at the Humanities Research Center, The University of Texas at Austin. The broadside is published in an edition of 226 numbered copies, the first 26 of which are signed by Celia Zukofsky. [50.8 x 40.6 cm, color facsimile]. About the Gas Age. 1969 Ultima Thule Book, Arcadia, Percy Street, Newcastle upon Tyne, Edition limited to 400. Thanks to Mike Shayer who did the transcription. Poem 73 of Catullus, by Louis Zukofsky. 1982 MS Postcards Series One, Number Three. Designed and printed at Simon Fraser University, Burnaby, British Columbia, Canada. Printed in Mahagonny City by B. Brecht [Peter Quartermain, Slug Press, Vancouver]. 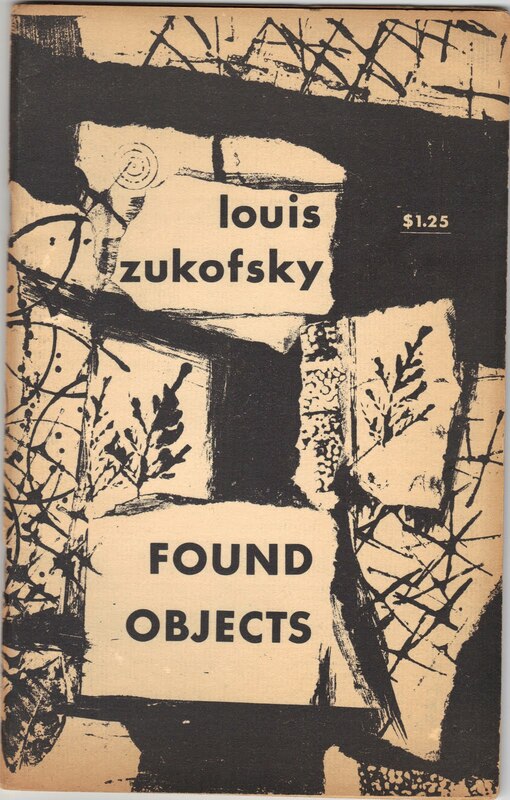 Some score copies of this, the last Valentine poem and possibly the last poem Louis Zukofsky completed before his death on May 12 1978 is privately issued in a special limited printing to The Friends of Louis Zukofsky to mark the poet's 80th birthday, Jan. 23 1984." [2 pages].